Co-directors Christopher and Melinda Borg run this 16 acre landscaped space. The gardens have open grassy areas, lakes, stream and bridges, surrounded by a tropical rain forest of deciduous and large Eucalyptus trees. Large scale outdoor sculptures by leading Australian artists are displayed including Ron Gomboc, Bert Fleugelman, Anthony Pyror, Jan King, Michael Snape. The sculpture park began in 1988 as Sculpture Park ’88. Developed and financed by gallery directors Norman Glenn and Roderick Bain. 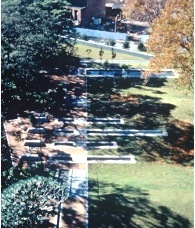 Planning began in early 1987 and the focus of the park was to highlight the work of contemporary Australian sculpture. Ceramic Break, was founded in 2003 by sculptor Kerry Cannon. The park features Cannon’s bronze sculptures set within the rural scenery and bush lands of northern New South Wales. On a rock mound in an area of the park an ongoing participatory project is unfolding called Ceramic Break. Visitors are encouraged to bring a piece of ceramic pottery to break at the mound and contribute to this growing artwork. In addition to the works outdoors, there are three galleries which exhibit paintings and sculptures by local artists. Ceramic Break Sculpture Park is open March to December, Thursdays - Sundays from 10 am till 5pm, or by Appointment. Admission is charged. Located on the shores of beautiful Lake Macquarie, this public gallery has built a strong reputation for its diverse changing program of exhibitions by nationally significant and local artists. 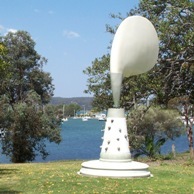 The sculpture park in the gallery's expansive grounds was established in 1996 with the inaugural Lake Macquarie Sculpture Prize, which continued for three years. Currently the park hosts a collection of over 10 permanent works by artists such as Janet Laurence, Richard Tipping and Trevor Weekes. It also includes major projects undertaken with the community including 'The meeting place' (2003), dedicated to respected local Aboriginal Elder, the late Uncle Cyril Archibald. The gallery's opening hours are Tuesdays to Sundays 10am - 5pm and selected Public Holidays 11am - 4pm. Pictured: John Turier, Aeolian Tree, 2001. Established in the University's Silver Jubilee Year in 1992, the sculpture park presents the depth and breadth of Australian artistic talent and is the first of its kind to become a permanent feature of any university campus in Australia. This sculpture park is an interactive experience. The natural surroundings provide an opportunity for visitors to visually engage and explore at their own leisure. The University's open parkland of 125 hectares features significant flora and fauna reserves, heritage sites, and an earth sciences garden. Peppered amongst these natural features are some 130 original sculptures by leading and emerging Australian and international sculptors. Tours, catalogues and brochures available. Open daily 10am–5pm (closed Christmas day). Admission to the permanent collection is free. Admission prices may apply to special exhibitions. Established in 1997, Sculpture by the Sea is Australia's largest free to the public sculpture exhibition of over 90 contemporary sculptures from across the globe. The works are sited on beaches, rock shelves and parks transforming Sydney's Bondi to Tamarama 2km coastal walk into possibly the world's longest temporary sculpture park over a ten-day period. Located in a tranquil rainforest garden, between the Illawarra escarpment and the Ocean, Wombarra Sculpture garden has over 35 outdoor sculptures on display. The sculptures are in all sizes and media, including stone, bronze, steel and concrete. Wombarra is an hour from Sydney by train or car. View the website before visiting as the garden is only open a few days each month. Artist Anita Glesta created a site specific artwork in 2000 that functions as terraced water garden within the Cook and Phillip public park in Sydney, Australia. Using indigenous sandstone and water as her choice of materials, the work makes reference to the original creek which was once present on the same site. As an established artist in the public realm, Glesta has worked on several large-scale international projects. Among these projects is the seven-acre landscape work ‘Census’ in the grounds of the Federation Census Bureau Building in Suitland, MD, (USA), which was completed in 2008. Glesta lives and works in Sydney, Australia and New York, USA. For more information about the artist, visit: www.anitaglesta.com.